The MENA HR Summit brings together HR leaders to discuss and deliberate on key issues in the HR industry in the region and craft strategies to combat current challenges. 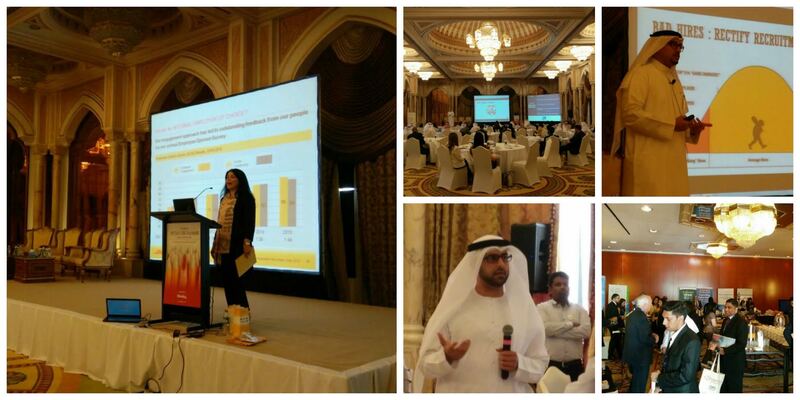 Abu Dhabi: The 9th Edition MENA HR Summit commenced yesterday at the Intercontinental, Abu Dhabi which witnessed global HR leaders stage a dialogue on devising effective strategies to realize the true potential of talent acquisition in the region. Chairpersons Hessa Al Ghurair, CHRO at Commercial Bank International and John Rason, Global Head of Consulting at Santa Fe Group inaugurated the conference followed by the ‘International Keynote’ address by Farnaz Ranjbar- VP Business HR Global & Europe, DHL Express titled “Engagement @ DHL-From good to great”. The first track titled “Preparing our organizations for the next wave of millennials” had sessions addressing workforce optimization, training and development for the millennial workforce by Dr. Othman Al Khoori – SVP HR at Mubadala Petroleum, Sriram – Head of OD and Knowledge Academy at SIG Combibloc Obeikan (CBOB). The need for two-tier recruitment strategy and accelerating leadership was elaborated by Dennis O’Donnell, CEO at Oakwood International (Platinum Sponsor for this Event). Zuhair Al Haj – Director of HR & Localization – MENA, Al Futtaim Group and Norman Kurtis- Vice Dean, IE School of Human Sciences and Technology and Frank Farrell, VP Learning & Organizational Development at ADCB joined the “HR Leaders focused panel dialogue” where they discussed the current technological and sociological drivers of employment in the region. The chairperson John Rason, while addressing a session on managing mobile talent said “It is evident that there is a real gap between the operational activities that consume the most time and the value added activities that business leaders see as the critical value that they want from their Global Mobility teams. Shifting perception of value is often a difficult transformation. To some extent, this is easier if the organization has a strategy to reduce its total company cost base due to external economic factors and shareholder pressure to increase EBITDA. Such a reason can stimulate greater focus on the case for change in the Global Mobility arena.” In an exclusive session Alex Davda, Business Psychologist and Client Director – Ashridge Hult and Rory Hendrikz, MD at Ashridge Middle East addressed the “Team leadership insights from the high performance Volvo Ocean Racing”. Ashridge Hult is the Gold Sponsor for this event.The conference sponsors – SIRVA and HireRight (Bronze Sponsors), Neuro Leadership (Leadership Transformation Partner), Soltius (Networking Partner), SantaFe (Talent Mobility Partner) and IE Business School (Workforce Development Partner) demonstrated their innovative solutions and technologies tailormade for the HR industry to equip them with better market reach and to promote healthier talent engagement. The concluding session for the first day included a Fish Bowl Session on “Leveraging Diversity and Inclusion for Business Success” which was joined by Ahsan Qureshi – SVP Human Capital at Mubadala, Christian Hobson – Group Head of Talent at Standard Chartered Bank and Priti Lilwa – Sr. Business Development Manager at SIRVA. The session explored how Middle East can effectively balance the expatriate and local talent together to boost productivity and enhance innovation.Today, the second day of the conference will feature presentations on HR Transformation, Competency Mapping, Digitized Learning, Talent management, Foundational Neuroscience for Leadership, Emirates NBD case study and much more from Dolphin Energy, ENOC Group, Neuroleadership, Tanfeeth, Kuwait Oil Company and more. Tomorrow, Day 3 of the event will focus on Masterclass Workshop on “Using HR Analytics for Better Decision Making” and “Leadership Vs Management”, which will be conducted by Janine Bunning, MD at Oakwood International and Chartered Fellow of the CIPD.